Overview: Diamonds could be your best friend if you have a go on this 3 coin classic slot machine. WIN UP TO 2,500 COINS! 1 LINE, 3 COINS. WILD X2 MULTIPLIER. Online Play: This slot machine is featured at online casinos that run Saucify software. You can try it risk-free by utilizing the free, no-deposit welcome bonuses that are offered at many Saucify sites; if you decide to play for real, then be sure to play at a Saucify casino that offers an initial deposit bonus of at least 100%. 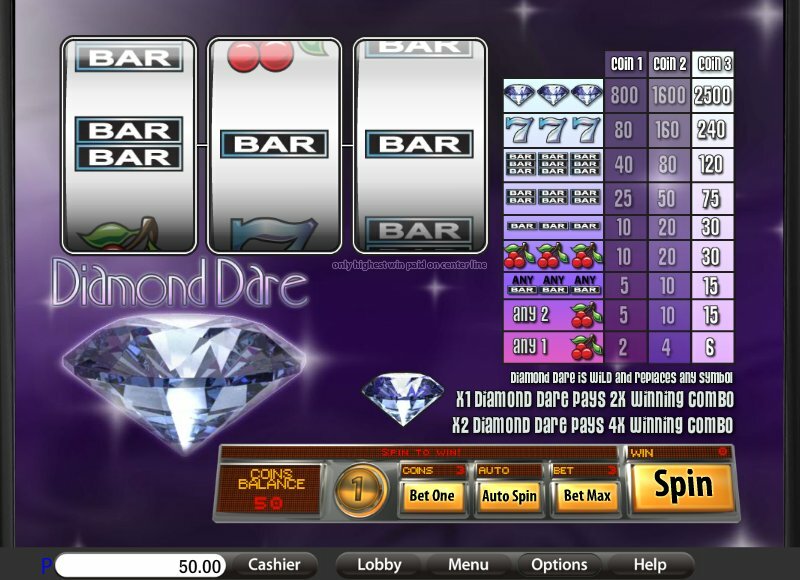 Similar Slots: If you like Diamond Dare, you might like these other slot machines from Saucify: Diamond Dare - Bonus Bucks, Dream Wheel - Progressive, Magnificent 7s, Overdrive, Pina Nevada, Rising Sun.